E-mail is hot! This title will jump off the shelf of your teen display area. The fun cover and cool interior design will catch the eye and hold the attention of both teen consumers-and their gift-giving parents and grandparents! Teenagers today are computer savvy and they love to communicate with their friends! Honor Books, publisher of the best-selling youth book, WWJD: Stories for Teenagers, is pleased to present this new devotional book that will help teens draw closer to God and experience His love! 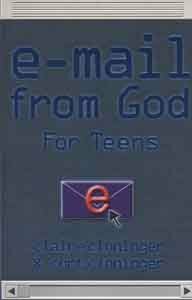 "E-mail from God for Teens" will "alert" teenagers that they have "mail" from the Best Friend anyone in the world could ever have: God, the Creator of the Universe. These "on-screen," one-page per day, "e-mails from God" target the real spiritual and life issues teenagers today are faced with. Teens will learn just how much God really loves them!